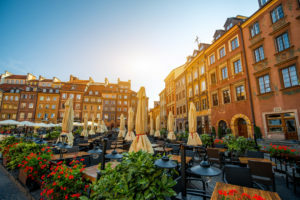 This ideal one-week private package is the most comfortable way of connecting visits to Warsaw, Krakow and Zakopane with time to explore all the top cities on your own. Enjoy sightseeing with the best local guides as well other attractions like the Jasna Gora Monastery in Czestochowa, Wieliczka’s Salt Mine, the Tatra Mountains and Auschwitz Holocaust Memorial. Prices above exclude accommodation and alimentation. Groups over 8 participants are calculated upon request. Ask for special offer! Arrive to Warsaw. Meeting with a driver and transfer to your hotel. Free rest of the day. Meet with one of the best local guides and explore such highlights as The Old Town (the Castle Square – St John’s Cathedral – the Old Town Market Square – the Barbican), the Royal Palace on the Water (Lazienki and the Frederic Chopin Monument), the Royal Route and the former wartime Jewish Ghetto (the Umschlag Platz, the Museum of Polish Jews). Discover Praga, the most authentic Warsaw area, nowadays becoming famous as an artistic district. Compare it with the business downtown and the area around the House of Parliament. The Monastery of Jasna Gora is home of the miraculous “Black Madonna” painted icon. The mysterious image helped to make Czestochowa one of the most important pilgrimage destinations in the world, right after Rome, Lourdes and Fatima. The tour includes the Miraculous Picture Chapel and the Basilica, the 600th-Anniversary Museum, the Arsenal and the Treasury. Arrive to Krakow in late afternoon. One of the most professional local guides will take you around the magical Old Town: up to the Castle and Cathedral on the Wawel hill. Following the Royal Route, you will see the ancient Jagiellonian university areas and walk through the largest mediaeval square in Europe. While there, stop to visit the oldest shopping mall, the Sukiennice, and the Church of the Virgin Mary (with the magnificent Gothic wooden altar by Wit Stwosz). The tour finishes at the fortified city walls beside the Barbican Gate. The tour was perfect for us. Everything was arranged perfectly. Great tour with great people. Needed more time in Warsaw. At least one more full day. The 7:45 am start was too early when leaving for Zakapone. We didn't even arrive late there, but were tired the whole day. We did not like Hotel Home, there was no way to hang the shower head (so you had to take a bath?) and the glass walls on the bathrooms did not offer any privacy. The air conditioner was very loud and we didn't sleep well. Our driver [...] Read full review guide for the Zakapone part of the trip was great and we were very happy with him. We were also very happy with our guide on the Warsaw city tour. This was our honeymoon so we wanted everything to be perfect, but sadly it wasn't. We had the best tour guides, drivers and itineraries that fit so beautifully with our plans. We were very impressed with all the people that we met who were hires to look after us, right from the first pick up at Kraków airport! Hotel Columbus was excellent with the most friendly people. Kraków was spectacular as were the tours to Auschwitz, Salt [...] Read full review Mines, Zakopane, and old town Kraków. Our guides were flexible and met our needs perfectly! We LOVED our trip! We were very pleased indeed with the choice of hotels provided. Excellent locations near town centres and all of a very high standard. I was expecting problems with the paperwork but there was none ! The train system is also worthy of special mention. Purchasing tickets on the rail website was also extremely easy and convenient. Very well organised and all the transfers on time. The guides were friendly, helpful and knowledgeable. Fantastic! I loved Poland. The tour was great as were the guides and drivers. Everything was perfect and we had no complaints about anything. From the hotel accommodations to the tour sites to the drivers and guides, everything and everyone was wonderful!! Our tour guide spent way too much time on the phone. We felt at times like we were a burden and he'd rather be elsewhere. It was rude of him to be on the phone like he was. He also was not a tour guide but a taxi driver.